Originally released in South Africa in 1994 on the Mighty Good Sounds imprint, Sea Bee’s debut album was a hit in the earliest days of kwaito, epitomising the house-infused soundtrack of a newly democratic nation. While it may have been Sea Bee’s release, the key to the album’s success was the magic touch of Spokes H, who composed, produced and arranged all the tracks. Sea Bee would soon disappear off the radar, while Spokes remained an influential and popular figure in SA until his untimely death in 2013. The latest release on DJ Okapi’s Afrosynth Records removes two tracks from the original six-track album, keeping four of the choicest downtempo dancefloor bombs – "Home Boy", "I Wanda Why", "Thiba" and "Stoppa" - all heavy on the bass, with uplifting vocals and unique lyrics guaranteed to increase the energy on any dancefloor, in any country at any time. 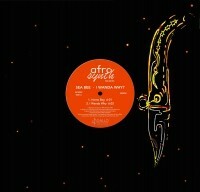 Patrick says: DJ Okapi flicks through his record box, picks out a total Kwaito classic and trims off the excess fat, offering us the solid sounds of Sea Bea as a DJ friendly 12". Chunky and funky with all the African flavour you could ask for!